Did you ever wonder what it must be like to be a businessman in Detroit — one of the few who are left? If so, look no further than the nationwide fast food strikes happening today, where a Detroit McDonald’s was forced to close because its employees walked out over a pay dispute. Apparently, entry level jobs are now supposed to support entire families. The requested minimum wage: $15 per hour. Over 200 protestors crowded the restaurant, carrying signs that read “We are worth more. 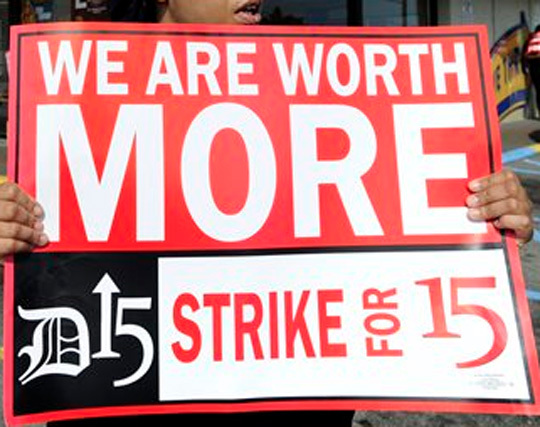 Strike for 15,” as in $15 an hour. Terrance Collins told WWJ’s Vickie Thomas he has worked at McDonald’s for a few years, and has been struggling ever since. Workers say they want $15 an hour, which would be about $31,000 a year for full-time employees. That’s more than double the federal minimum wage, which many fast food workers make, of $7.25 an hour, or $15,000 a year. Ashton Kutcher recently said that there was never a job he worked that he was better than, and he was right. Work is an honorable thing. Employment at McDonalds is just as honorable as employment at any other establishment. With that said, flipping burgers at McDonald’s is not something that is meant to support a family of four. If prices and wages are just arbitrary numbers cooked up by evil McDonald’s franchisees to line their cash with as much money as possible, why stop at $15? Why not $20? Or $25? Or higher? The reason is because underlying prices and wages are basic economic principles. Sadly, no matter how many times a McReality burger is served to the citizens of Detroit, they reject it. 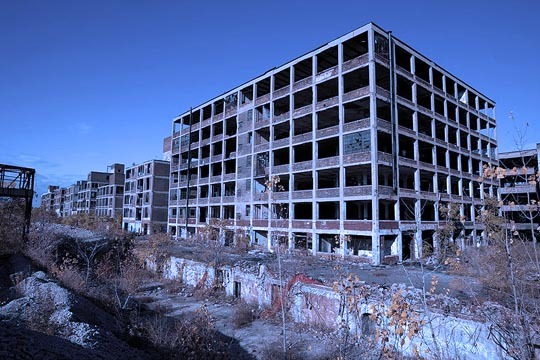 Detroit is a city that has been run by Democrats for decades. Decades. The same mentality that spurs someone to demand $15 dollars an hour to ring up a Happy Meal is the same mentality that turned the city into an empty husk of what it once was. The people who are protesting McDonald’s aren’t dumb. To borrow a line from Ronald Reagan: they just know so much that isn’t true. The result is a bankrupt city filled with crime that no one wants to open a business in. Detroit has been spending on average $100 million more than it has taken in for each of the past five years. The city’s $11 billion in unsecured debt includes $6 billion in health and other retirement benefits and $3 billion in retiree pensions for its 20,000 city pensioners, who are slated to receive less than 10 percent of what they were promised. Between 2007 and 2011, an astounding 36 percent of residents lived below the poverty line. Last year, the FBI cited Detroit as having the highest violent crime rate for any major American city. In the first 12 years of the new century, Detroit lost more than 26 percent of its population. Employees in Detroit who are protesting McDonald’s should be thanking the franchisee who took a chance by opening a dining establishment in a city on life support. Instead, they attack the man trying to apply the defibrillator. Previous Entry Will Nobel Peace Prize winner Obama spark a world war with a strike on Syria? Next Entry What if you attacked your problems like Diana Nyad attacked her historic swim? I’m sure there are a flood of ‘undocumented workers’ who’d be glad to shovel fries and clean under the greasetrap for a lot less than 7 per hour. I recently cut, tedded, and baled hay for that price and was happy to get the work. Ah, the good old days … when the national debt was just a tad under, umm, $15 trillion. Now it’s frozen under $17 trillion using accounting practices that would get us thrown in prison. These people need to get over their feelings of “entitlement” and realize that jobs like those at McDonald’s were NEVER meant to be career choices. If you don’t like minimum wage – go to school! Get an education like millions of others have done and move on to something better! Thanks for reading and commenting, Stephen. I appreciate it. It boggles my mind how someone can take a job at McDonald’s and then complain because they can’t raise two kids on the salary. The best way to get a better salary is to learn marketable skills people will pay more money for. Walking around with a sign that says how great you are is probably not the best plan for securing long term prosperity. I agree with Stephen. They need to get over their sense of entitlement and learn some common sense and get a life. If you want decent money, learn marketable skills. You’re not going to be able to raise kids on a minimum wage salary. It’s not the corporation’s fault; it’s their fault for not thinking the whole thing through. This makes me glad I no longer work at McDonald’s. Even during my three years there, I frequently looked for other work that would pay me more than what I was making there. I knew I wasn’t going to become a millionaire working there. I need a better wage..then work for it. Even McDonald’s has higher paying jobs if you earn them. The bottom job at fast food was not intended to support a family. People need to stop expecting things given to them and instead earn them. Why is the wage $7.40, it is because that is the market rate. How much would a burger be if they paid there labor $15 an hour! The prices would jump up but the average person making minimum wage does not understand the reality of that. They also do not understand that if the wage goes up all costs will go up and they will end up with even less spending power. On top of that all of the money everyone has saved will see a decline in value. The average person just does not understand how the world works. If they do not want a bare bottom market rate job they need marketable skills and that would mean they have to actually do something about their position and find a way to improve themselves. For example there is still a need for more plumbers why not take that job….it requires some training but I know plumbers that make $100K a year. The jobs are there if they are willing to earn them. People make jokes about Stallone, but he is capable of writing some wise and touching scenes. Here’s a good blog post about this whole thing I found. I may write my own take later on. Thanks for sharing, Carl. I have a few issues with some of what he said, but I’d say I agree with 75% of it. I think you should write on this issue. You had first-hand experience, so your perspective would definitely be a welcome addition to the discussion. Yes, I’ve debated whether or not I should weigh in on this, considering that I worked at a McDonald’s for three (very long) years. I probably will soon. Like i said, even back then I knew it wasn’t going to be a long-term job and kept searching for better jobs (although Cargill was a flop, since they fired me after one day for reasons I’m still not entirely sure of, but that’s neither here nor there.) In hindsight, I was probably at McDonald’s for too long. Any longer and I’d have gone completely insane. Plus, Five Guys is light years better. Another reason I quit was because I didn’t want to be like a few of my managers and co-workers and still be working there when I’m thirty, forty, fifty years old. Some of them started when they were fifteen/sixteen and never quit, which I found to be embarassing. I worked at a retail chain from teenager to my 40s and went into management. For the most part I enjoyed it and liked who I worked with. I think McDonald’s does do/show some positive things with their efficiency and staying power. While I disagree they should be mandated to jack up wages; I think they can teach a worker basic business and teamwork; if an employee is looking to leave at least learn the positives of McDonald’s and use it for future interviews and maybe that experience will help solve a problem at the new job. As Douglas (and Ashton Kutcher) said; all work is an honorable endeavor we can learn from all situations. Even with “bad” bosses (I’m sure Carl and I can exchange some good retail stories!) you learn what not to do when faced with those situations. I found a few McDonald’s employees who have a legitimate case for getting $15 an hour. The audio is apparently faked, but it’s still amazing.